Oh, the East End of London—home to the original Cockney, successive waves of immigrant communities, the YBAs (Damian Hirst and his ilk), that scandalous soap East Enders, the Museum of Childhood, the 2012 Olympics, and yours truly. Since the 17th century, when the French Hugeunots set up camp just to the east of the medieval City of London, the East End has served as London’s working-class, immigrant community. In the 18th century, the Irish weavers moved in, followed by Ashkenazi Jews in the 19th century; the Bangladeshi community arrived in the 20th century and more recently, drawn by the cheap rents and bicycle-friendly streets, artists and their hipster cousins have joined the ‘hood. Each of these groups brought their own vibrant customs and cuisines, and the resulting mix offers anyone willing to venture outside the comforts of Central London a plethora of interesting things to do, see, buy, and eat. Running between London Fields park and Regent’s Canal, Broadway Market (along with my flat) sits at the northernmost bit of the East End. 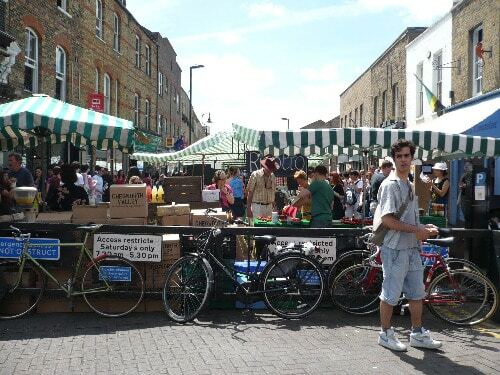 The pedestrian-filled thoroughfare has hosted a weekly food market since the 1890s, and today’s version has more than 80 stalls of fresh produce, organic meat, locally grown flowers, ethically sourced coffee, artisanal food, vintage clothing, handmade crafts, etc. The stalls officially open each Saturday at 9:00 am, and by noon the street is thronging with local residents buying their weekly groceries, hipsters nursing hangovers with Thai green curry or Caribbean rice cooked on the spot, little kids weaving through the crowds as their parents sample Stilton, Comté, and Emmenthaler from one of several cheesemongers, and tourists snapping pictures of the accordionist busker and his tap-dancing ladyfriend. 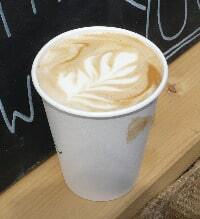 I generally start my Saturday at the south end of the market with an espresso drink from the Climpson & Sons stall. As GFS contributor C.C. noted during her time in Old Blighty, Britain is not known for its coffee, what with its centuries-old love affair with tea, but if you know where to look, you can enjoy some damn fine coffee in London. In fact, the 2010 World Barista Championship was held in my adoptive city. Thanks in large part to the arrival of our Australian and Kiwi mates, who imported a heavenly concoction called the flat white—roughly a cross between a café latte and a macchiato—those of us who are a wee bit coffee obsessed can live happy, fulfilled lives in London. Climpson & Sons roast their own beans, which you can buy at their stall on Saturday or in their cute little shop (67 Broadway Market, on the north end of the street) during the rest of the week. Their espresso is strong, not bitter, and they froth up that organic milk perfectly. Most of their milky-coffee drinks will set you back £2, which, given the current exchange rate, is cheaper than a tall Starbucks whuppaccino and incomparably better. Once appropriately caffeinated, I wind my way around the market, stopping at various stalls to taste cheeses, sausages, breads, olive oils and vinegars, flourless brownies, and the like. In the centre of the market, a man called John runs a fruit and veg stand, which he’s been doing for nearly 50 years. His stand has easily the best prices in the market, and, last week at least, his strawberries were ripe and divine. However, if you’re in the mood for something less heart-healthy and more savory, then stop by Andy Bates’ Eat My Pies stall for a Scotch egg—a British, erm, delicacy. Andy will be happy to serve you anything from the traditional Scotch egg to the less-traditional Thai red curry variety (which is a spicier version of the traditional hard boiled egg covered in sausage meat, then rolled in bread crumbs and deep-fried). 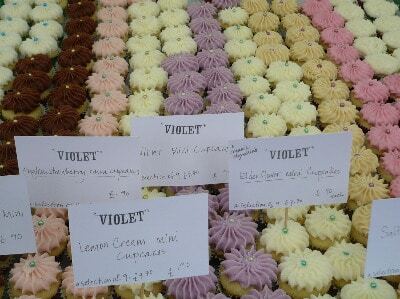 No visit to the market is complete without stopping by Violet Cakes‘ stall for some of their incredible (buttery, American-style) cupcakes. The English sometimes call these fairy cakes, but I refuse to participate in such tomfoolery. The salted caramel variety is mouth-wateringly delicious and comes in both twee and regular cupcake sizes. Because I’m a glutton, I like to eat the regular-sized salty sweet cake first and follow it up immediately with a big, juicy bratwurst from the German stall. Naturally, I order my brat with the works—German mustard, ketchup and sauerkraut—but I’ve been told these dogs are just as tasty accompanied only by their crusty rolls. Of course, no trip to an English market is complete without a stop at the pub. The Dove Free House, in the middle of the road, offers up an old-fashioned country pub feel, with its rabbit warren of small, dark rooms and heavy wooden furniture. Order whatever special ale is on offer, it’s usually the best (and often Belgian…don’t tell the Brits!). If people-watching is your thing, then hit up the Cat & Mutton on the northeast corner of Broadway Market. This airy pub has plenty of outside tables and a painfully, entertainingly hip clientele. You may even spy some of them dancing on the bar. Should you find yourself on Broadway Market on a non-Saturday, despair not. The street is home to several charming gastropubs, organic grocers and well-stocked corner stores, a friendly fishmonger, a butcher, a baker (sadly no candlestick maker), and many good restaurants. Feeling carnivorous? Try Buen Ayre. 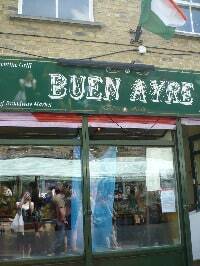 This Argentine grill can fill up quickly, so it’s best to make a booking, as we say here. If you’re with a friend or two, order one of the parrilladas. A sizzling hot mini-barbecue overflowing with various cuts of beef, sausage, blood pudding, and cheese will arrive at your table, cooked to perfection. Make sure you’re ravenous because the portions are generous—even when sharing with two friends, we each left with a doggie bag. 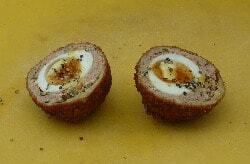 Looking for lighter fare or gourmet treats for a picnic in the park? Head for L’eau à la Bouche across the road. 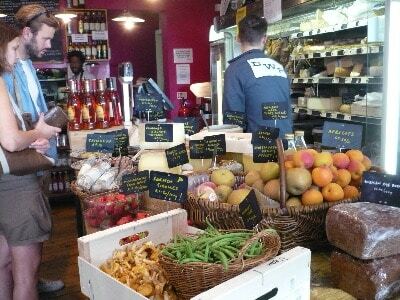 This French café and delicatessen sells meats, cheeses, olives, fresh bread, quiches, chutneys, and other sundries. They also offer a wide variety of sandwiches made to order for around £6. I’ve been slowly eating my way through the menu and have yet to make a misstep, although I’m partial to the irresistible combination of salty Iberian ham with tangy mustard and greens on ciabatta. 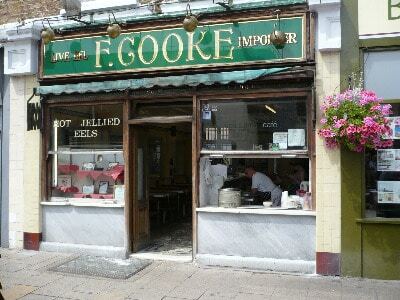 Finally, for some old school English nosh, try F. Cooke. This traditional English pie and mash shop opened in 1900 when Fred Cooke started selling jellied eels to the folk hanging around the original fruit and vegetable market. The restaurant is now run by Cooke’s grandson, Bob, and still serves hot and jellied eels, although if your tastes are not so aquatic, you can get some ale, mash and meat pie. On a chilly London day, no matter the time of year, nothing will warm you better. Tuck in! 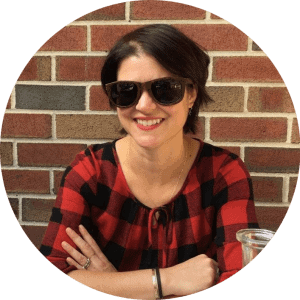 Now that West Coast native Meredith Brown has successfully received her doctorate from the Courtauld Institute of Art, she’s free to down double espressos, sip martinis, nibble pork belly, and explore other culinary delights. When she’s not zooming from London to Paris to London to D.C. and back to London, Meredith is now happily settled in New York with her books and barbecue.